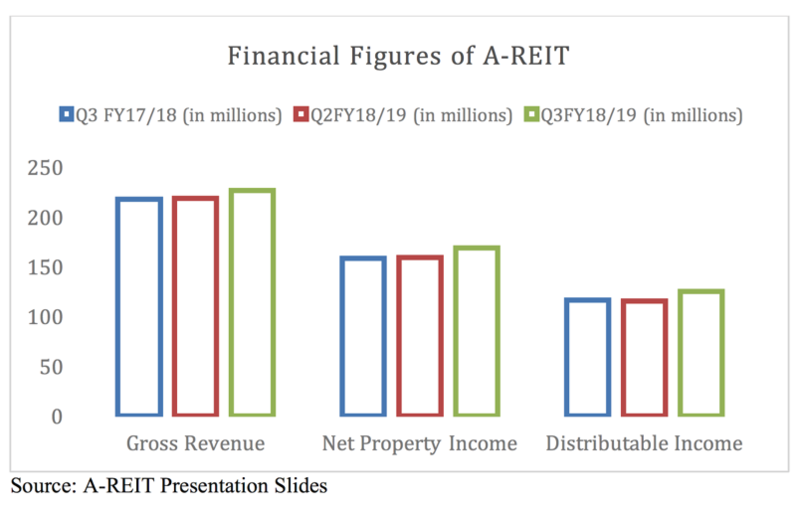 This article presents the second part of the series, where we take a closer look at A-REIT’s financial health, their latest quarterly financial report, and their upcoming plans for the future. With the latest financial figures of A-REIT in Q3 FY18/19, we compare them with the figures from the preceding quarter (Q2 FY18/19) and with the same financial period of last year (Q3 FY17/18). Q3 FY18/19 posted the highest Gross Revenue across the 3 aforementioned quarters. This was mainly due to acquisitions of mostly logistics properties in the UK and Australia in 2018. The increase in gross revenue compared to the same quarter of last year was partially offset by non-renewals at certain properties located in Singapore. Further, Q3 FY18/19 posted the highest Net Property Income across the 3 aforementioned quarters. This was mainly due to lower tax and operating expenses incurred in Q3 FY18/19 compared to Q3 FY17/18 and Q2 FY18/19 respectively. Moreover, Q3 FY18/19 posted the highest Distributable Income across the 3 aforementioned quarters. However, this was due to the rental support A-REIT received from the new acquisitions from the UK and Australia. Be cautious that as the rental support from these properties expires, the distributable income of A-REIT might fall. Hence, A-REIT needs to ensure that the performance of the newly acquired properties is of sufficient standard to maintain a sustained growth in its distributable income. So do not be overly optimistic at this 7.0% increase in distributable income compared to the previous quarter. So, when does rental support for the new properties expire? 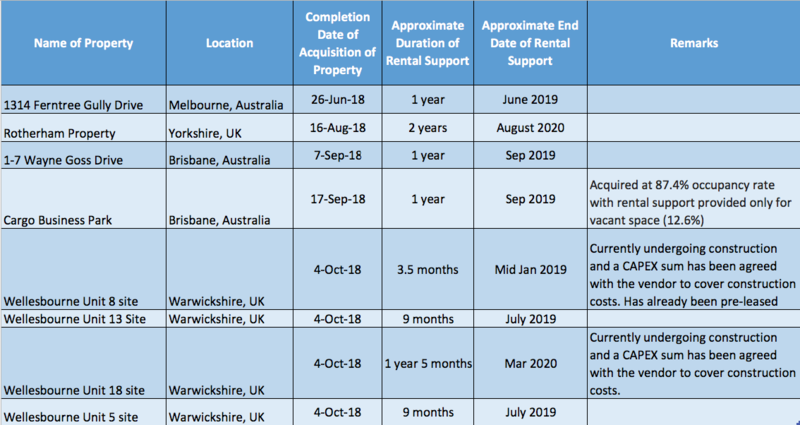 The table below shows the newly acquired UK and Australian properties in FY 2018/19 that are receiving rental support and when the rental support for the respective properties will end. The rental support for most of the newly acquired properties would end around the 3rd quarter of 2019. Despite the increase in distributable income compared to the previous quarter, A-REIT’s DPU increased proportionately lower. This was due to an injection of 178 million new units by A-REIT following a private placement. Equity was raised to the tune of $452.1 million as A-REIT prepares for new acquisitions of Industrial properties. 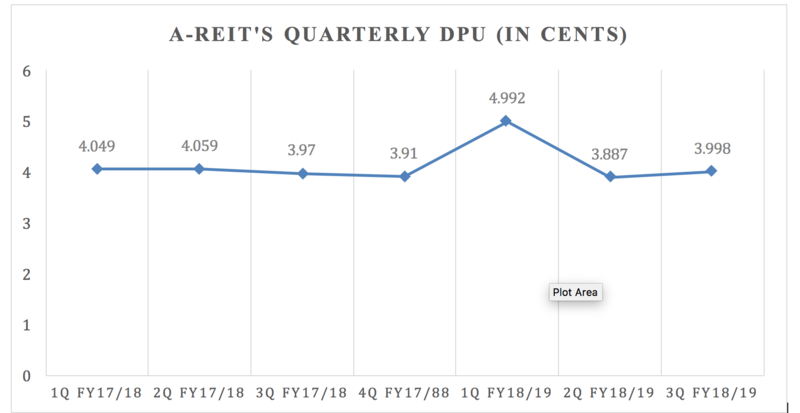 Regardless, A-REIT’s DPU has hardly shown any signs of consistent growth over the past 7 quarters. One indicator of a well-managed REIT is a track record of consecutive increases in DPU over many quarters. After all, one key reason why we choose to place our capital in REITs rather than the bank or underneath our pillows is that REITs offer us much healthier returns in the form of distributions. A-REIT has a well-spread debt maturity profile with no more than 15% of its total debt expiring in a single financial year. A-REIT’s weighted average debt expiry tenure remained stable at 3.6 years, up from 2.8 years in Q3 FY17/18. Its gearing ratio stands at a moderately healthy 36.7%, up from 33.2% in the previous quarter due to new debt incurred from the purchase of its second UK portfolio. 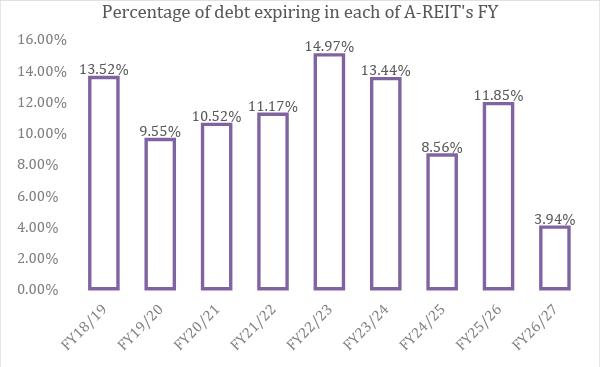 This gives A-REIT a debt headroom of $600 million before its gearing ratio hits 40%. Though some investors might feel uncomfortable over A-REIT’s gearing ratio, take note that A-REIT can also fund future acquisitions with equity in the form of rights issues, new share placements or perpetuals. As mentioned, A-REIT has already raised a significant amount of equity late last year via a private placement. In today’s climate of rising interest rates, there are concerns over the financial performance of REIT stocks. A-REIT would be less affected by interest rate hikes as 75.6% of its borrowings are hedged on fixed interest rates. However, A-REIT’s interest cover ratio has declined slightly to 5.3x from 5.9x in Q3 FY17/18. Nevertheless, we take the broad view that a REIT with interest cover above 5.0 remains in healthy territory. The graph below shows A-REIT’s Share Price/NAV Per Unit (NAVPU) over the past 3 years. The mean Price/NAVPU of A-REIT across 5 years is 1.20, which means that at A-REIT’s current NAVPU of $2.13, A-REIT’s fair price is $2.55 according to this method of relative stock valuation. This means that A-REIT is currently trading above its historical trading range at its current price of SGD2.80 at time of writing. A-REIT’s Occupancy Rate has not been stable over the years. Its forecasted occupancy rate for FY18/19 is at around 90%. 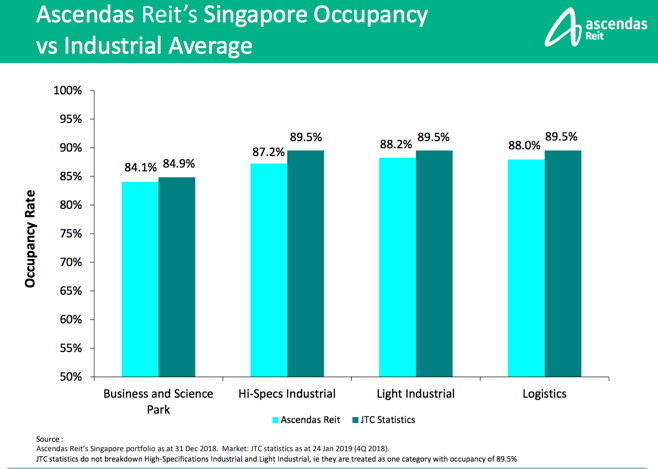 Further, the occupancy rates of various Industrial spaces for A-REIT is below the Industrial average in the Singapore market. 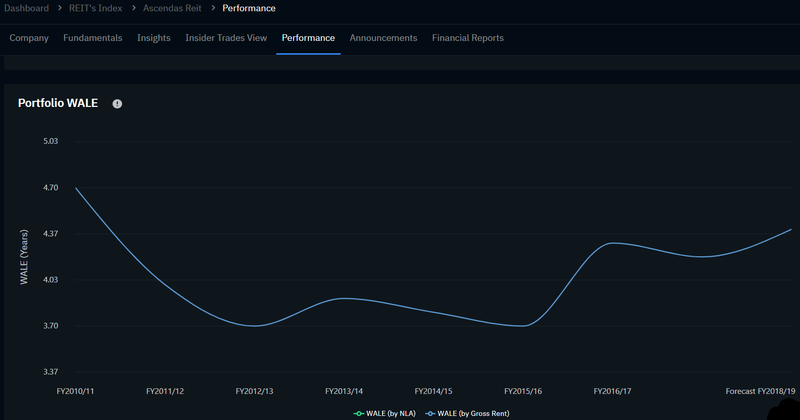 A-REIT’s Weighted Average Lease to Expiry (WALE) has also failed to show any signs of stable growth. Its forecasted WALE for FY18/19 stands at 4.3 years. Despite this, A-REIT exhibits a rather well-spread lease expiry profile. 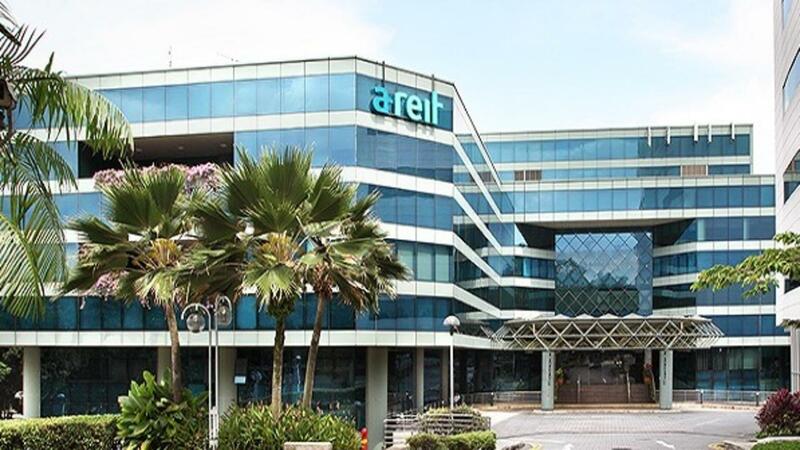 A-REIT’s WALE for the Singapore market is expected to increase from 3.9 years to 4.0 years. There is no significant impact on the WALE of A-REIT’s entire portfolio (assuming the BTS development was completed and the lease commenced on 31 Dec 2018). This BTS Business Park property would raise A-REIT’s proportion of Business and Science Parks (by asset value) in its portfolio from 33% to 34% (assuming the BTS development was completed on 31 Dec 2018). 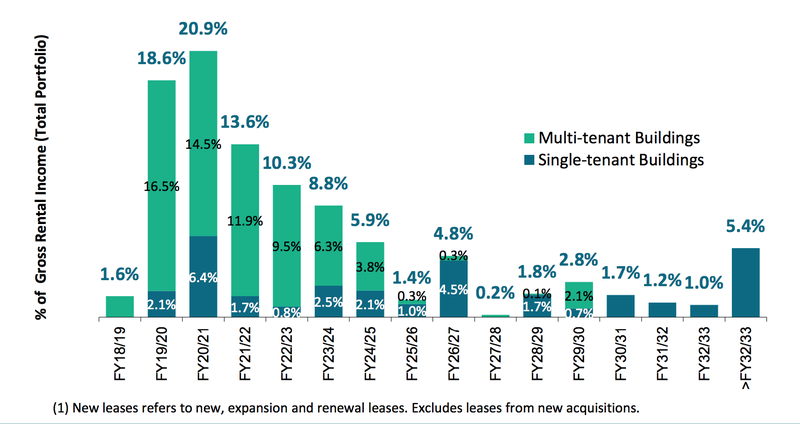 A-REIT’s income stability would improve from the long lease tenure of 11 years with an annual rental escalation, and a renewal option for a further 5 years. This development would be DPU accretive for the REIT, seeing a DPU increase of 0.033 cents for FY 2017/18. The pro forma document made no mention of whether this development would be NAV or yield accretive or not for the REIT. A-REIT’s fundamentals are hardly impressive in face of the sluggish Industrial Market in Singapore over the past several years. However, as new industrial property supply tapers off after years of booming supply, the market can expect a gradual recovery of the industrial property market. Singapore’s Ministry of Trade and Industry has forecasted a 2.6% growth in the Singapore’s GDP in 2019. This means that GDP growth would slow compared to the forecasted 3.3% growth in Singapore’s GDP in 2018. The threat of a trade war between the United States and China remains the key threat to the global economy and in turn, Singapore’s. In view of this, businesses remain cautious amid trade uncertainties and continue to review their business space commitments. So look out, as when America and China sneezes, the whole world catches a cold! And an economy as open and trade reliant as Singapore’s should should not be shocked if it catches an influenza from this! How should you screen for the best REITs to grow further your passive income stream? The selection of good REITs does not just boil down to basic financial figures – like a growing revenue, Net Property Income, and distributable income. These indicators are often presented nicely and prominently in the REITs’ presentation slides. But there are other crucial indicators of how well a REIT is managed– the extent of income support, property occupancy rates, and whether its Free Cash Flow figures can sustain its payment of dividends to investors. Such key indicators are often not easily located on the company’s website due to the heaps of documents located all over the company’s website. Even for more advanced investors, the thought of locating and plotting such information is often one of dread, due to the sheer tediousness of doing so. If you want such information to be presented to you directly via a well-designed and up-to-date software, check out https://www.reitscreener.com/. This was how I managed to present to you A-REIT’s WALE, Occupancy rate, and Price/NAV figures of over more than 5 Financial Years with just a few screenshots (Refer to the images above whose source is credited to REITScreener.) This makes for a much more thorough and efficient analysis of the REIT stocks you are interested in!